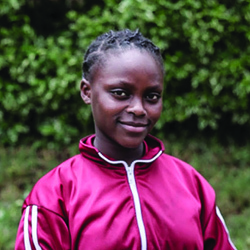 Hannah is a part of the 2018 graduating class at Uhuru Academy. She has one brother and two sisters and she comes from Muniu, a very rural community where she lives with her mother and siblings. She wants to be a broadcaster or a journalist, because most people from her community think that they are small and insignificant. She wants to shock them that someone small can be on TV. Hannah is physically small and she likes that. She likes Uhuru Academy because the teachers are good and the students are well cared for. She says that education is important because she wants to be able to take care of her mom and help her to not live in poverty. Click here to sponsor a student like Hannah.